May 1, 2014 – The Automobile Driving Museum, located one half mile south of LAX in El Segundo, CA, is a unique venue for auto enthusiasts. Not only is the Museum filled with over 130 vintage, antique and classic cars, it is the only museum that takes you for a ride in them. The Museum was established in 2003 in a vacant garage in West Los Angeles by two long-time enthusiasts: Founder Stanley Zimmerman and Curator Earl Rubenstein. For many years the two attended car shows, noticing “Look But Do Not Touch” or perhaps the clichéd “If you’re not naked, please do not touch my car” signs. This inspired their mission to not only preserve and interpret automobile history but also provide visitors with the opportunity to touch and sit in the cars and to actually ride in them. Moving to its present location in El Segundo in 2007, the ADM occupies over an acre of land and has 40,000 sq. ft. for automotive display, storage, repairs and restoration so that any vehicle can be prepared at will for the Sunday Ride Program, the raison d’etre of it all. With a rotating collection of over 150 vintage, antique and classic cars available for display, visitors can experience the span of automotive history from 1886 (with a Benz Motorwagen) to the modern era. In between are a 1904 Schacht Auto-Runabout, Ford Model Ts and Model As and examples of long-gone nameplates, including Franklin, Overland, Durant and Hupmobile. 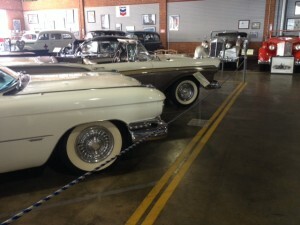 There are also more recent special interest cars such as the Avanti and the DeLorean. The Packard brand makes up the core of the collection, with over 20 examples from a rare 1916 Twin Six (one of three known to exist) to the Packard Hawk of the swan-song 1958 model year. 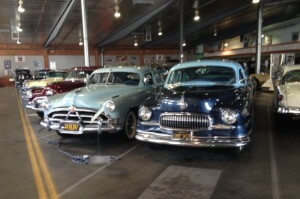 Most of the cars are located in a main display area and include examples of many other makes no longer manufactured such as Studebaker, Nash, Hudson, Kaiser and DeSoto. Virtually all of the cars are drivable and in continuous use on roads in the vicinity of the Museum. 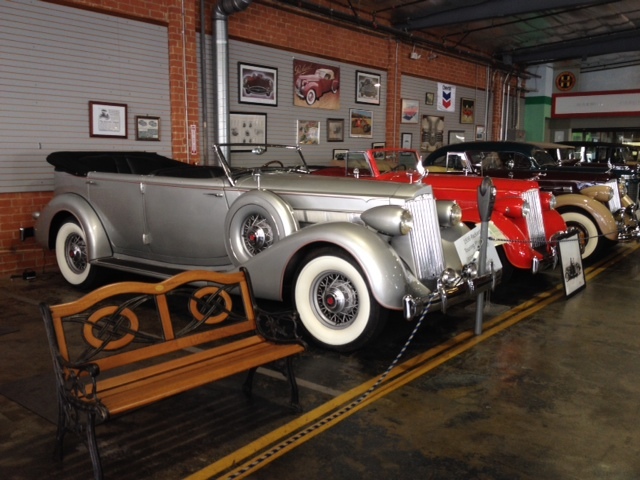 Some of the more valuable cars are parked behind glass in a vintage automobile “showroom.” On a recent visit these included a 1930 Weymann-bodied Stutz, a 1935 Chrysler Airflow, a 1937 Pierce-Arrow Town Car, a 1940 Packard Darrin roadster and a one-of-a-kind 1952 Packard concept car designed by Pininfarina. And this being Los Angeles, the ADM also has celebrity-owned vehicles that have belonged to such “golden age of Hollywood” luminaries as Howard Hughes, Errol Flynn and Jean Peters. There is also an unusual 1936 Packard Standard 8 Silver parade car that was built by the U.S. Government for Joseph Stalin. The ADM also serves as the official registry for cars built by Howard “Dutch” Darrin, famous for his custom Packards plus the Kaiser roadster that bears his name. The ADM is host to many events throughout the year, both private parties and special celebrations and movie presentations. In recent months the ADM hosted 50th birthday celebrations for the Mustang and the GTO as well as a Corvette Design symposium featuring designer Pete Brock. Entrance to the museum is free, but a $5.00 tax-deductible donation is suggested. It is open Tuesday through Sunday 10 AM to 4 PM, self-guided tours are offered on weekdays, docent-led tours are offered on Saturday and Sunday. The Ride Program is available on Sundays from 10 AM to 3:30 PM with a selection of three cars to choose from; children must be 10 years old or older to participate in the ride Program. 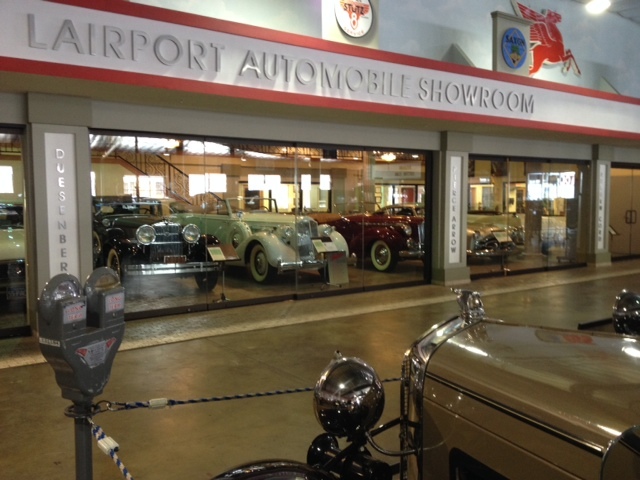 The ADM was established to preserve automotive history, interpret its societal significance and provide visitors with the opportunity to ride in one of the Museum’s vehicles. 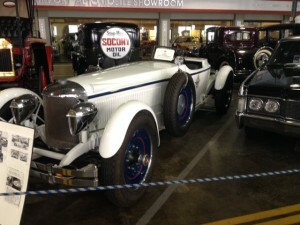 For any auto enthusiast visiting the Greater Los Angeles area, the ADM is well worth a visit.